For most foreign travelers, Cingjing, Sun Moon Lake, and Alisan are popular places of interest. Because the long distance and lower frequency of public transportation between these places, how to gather the information of public transportation and arrange a good itinerary becomes a big challenge for foreign travelers. Let's have a look of the simplified map. You can get quick understanding of the public transportation between these places. 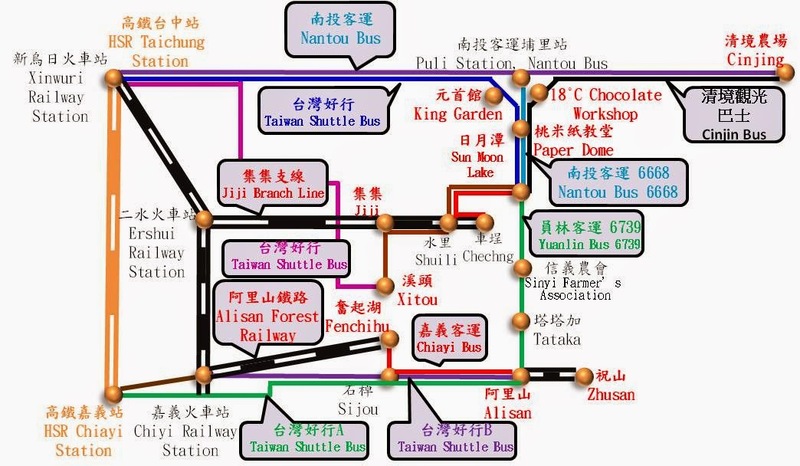 For example, The blue line between HSR Taichung Station shows the name of the bus line and tells you that the shuttle bus does not go to Puli Station.of Nantou Bus. And black line between Cingjing and Sun Moon Lake shows that in additional to transfer at Puli Station, there is a direct bus you can take. Be noted that the timetable, transportation lines, package tickets, reservation methods and etc. in here may not be always updated, especially in the end of beginning of the year. Please confirm the details from the original website before you arrive Taiwan. The following is a brief introduction about the Transportation Line & Timetable. You can read the following section Package Tickets before reading this section. The following itinerary is basing on the assumption that you start your trip from HSR Taichung Station(Taichung Train Station) or Chiayi Train Station(HSR Taichung Train Station). It is another topic that how to go to these terminal. You can take bus 156 or carpool, for example,to HSR Taichung Station if you arrive Taichung Airport. Although the bus line start from Taichung Gancheng station, you need to walk about 15 minutes from Taichung Railway Station with your luggage in the heavy traffic area. It is better to take the bus from HSR Taichung Station. You can take the direct bus if you can meet the time in the following timetable. There are 5 runs (6 runs in weekend/holiday) of direct bus.You can also transfer at Puli Station (HSR Taichung<->Puli and Puli <->Cingjing ) if you cannot catch the direct bus. The bus interval for HSR Taichung Station<->Puli is about 20~30 minutes only. There are also 2 choices. You can take Nantou Bus for Cingjing<->Puli & Puli<->Sun Moon Lake You need to transfer at Puli by this alternative. The bus timetable of Cingjin<->Puli is mentioned above and the bus interval of Puli<-> Sun Moon Lake is about 30 minutes. It's a cheaper alternative with total cost of 127+62=NTD 179 and duration, not including waiting time in Puli, of 70+40=110 minutes. Meeting point: The dock of Sun moon lake, right next to Hotel Dellago. Although the English note says "Please make the reservation at least three days before your departure day", The Chinese note say You should book at least one week before departure. Book ASAP! Confirm,Confirm and Confirm ! Since the mini bus has only 19 seats. You should confirm no matter by e-mail, phone or prints. For the passengers depart from Alishan to Sun Moon Lake, please dial the number 049-2770041 before 18:00 on the day before departure day to reconfirm the reservation. If not, the reservation would be canceled. ➣ Alisan Forest Railway Main Lines is only open between Chiayi Railway Station and Fenchihu Railway Station. The part between Alisan and Fenchihu is under maintenance. ➣ It takes about 3 hours by bus between Alisan Forest Park and Chiayi Railway Station. ➣ The sunrise platform is at the end of Zhushan Branch Line. The tickets of the branch line is sold on spot only one day in advance. Alisan Forest Railway Main Line is not totally open to public. 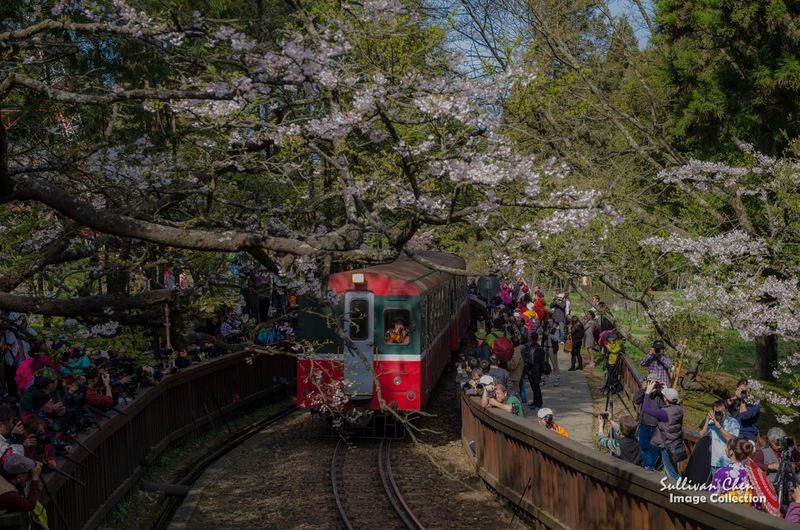 However, you can also take the forest railway between Chiayi & Fenchihu. 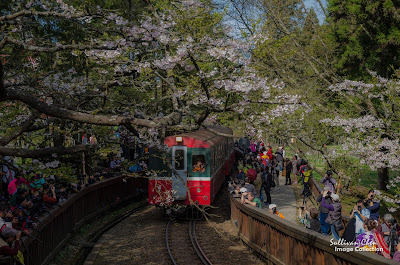 That's also the most interesting part of Alisan Forest Railway since you can experience how engineer designed the railway mechanism to overcome the climbing challenge 100 year ago. You can book from Official Website of Alisan Forest Railway 2 weeks in advance. For More details about booking Alisan Forest Railway, please refer to Booking Alisan Forest Train Tickets. Although you can not take Alisan Forest Railway from Chiayi to Alisan directly. but you can take the train to Fehchihu, arriving at 11:20, enjoy the famous Fenchihu lunchbox and then take shuttle bus to Alisan at 12:50pm. A common question from some traveling forum is day trip to Alisan. It is doable. The day trip is much easier if you can stay overnight at Chiayi one day in advance of your Alisan day trip. It is doable as well if you cannot stay overnight at Chiayi. However, it is exhausting. The following itinerary is day trip example from Taipei. ➢There is direct shuttle bus from HSR Chiayi Station to Alisan Station. However, it departs HSR Chiayi Station at 9:30 and arrive Alisan Train Station at 12:00. You cannot catch the Zhaoping Branch Line if you take the direct bus to Alisan. ➢Alisan Train Station to Zhaoping Train Station is 1.5km slight uphill. Most Alisan attractions are here. Take the Zhaoping branch line to Zhaoping Train station and go downhill make your day trip easier. You must arrive Alisan Train Station before 11:30 to catch the train since the last run is 13:00. ➢BRT stop and Alisan Shuttle bus stop is at different side of Chiayi Train Station. There is a footbridge crossover the train station.30 minutes (7:35 am ~8:25) of BRT is a rough estimation. It is pretty rush to catch the shuttle bus. 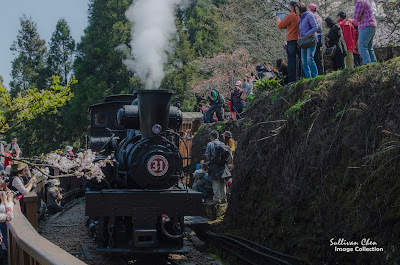 ➢In Alisan cherry blossom season, there would be Steam Locomotive between Alisan Train Station and Zhaoping Train Station in Wednesday morning. ➢The last shuttle to HSR Chiayi Station is 16:40. As the timetable mentioned above. there are only 2 runs of bus for each way between Alisan and Fenchihu and takes 1 hour. **Buy Zhushan Branch Lines tickets when you arrive Alisan Train Station. If you can book the train uphill and downhill, taking Taiwan trip bus to Alisan first and take Alisan Forest Train from Fenchihu to Chiayi in Day 2 is a better choice since you have 3 hours a Fenchihu. 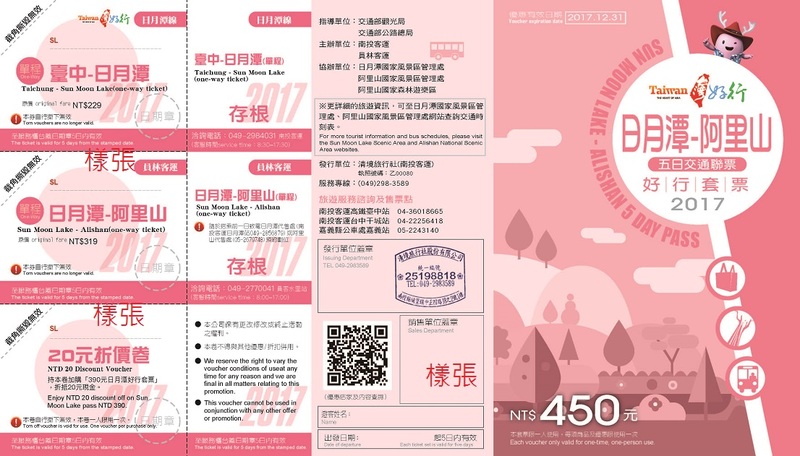 Since most visitors won't stay at only one places and needs tickets of ferry boat, cable car, and etc, there are some package tickets you can choose. 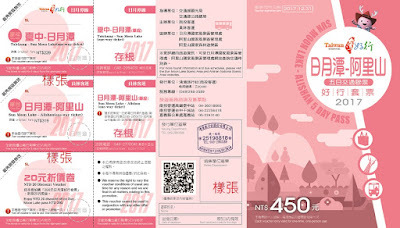 Follow the instruction on the package tickets and use the tickets one by one, the package tickets make your itinerary much easier.And most important , the discount for some package tickets may be up to 40%. 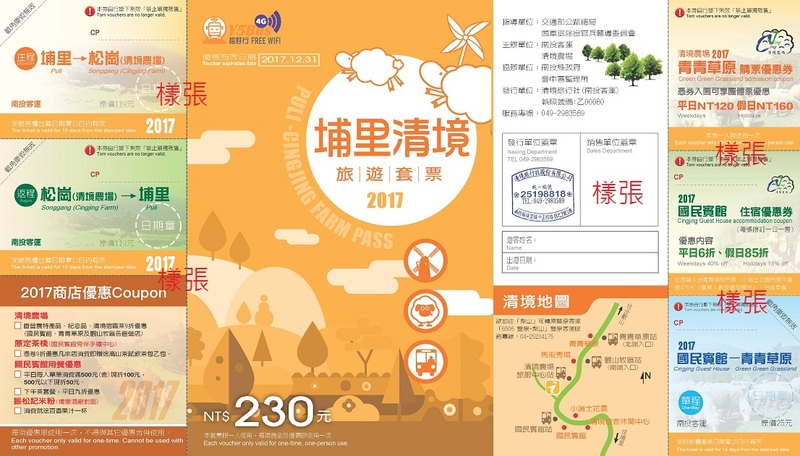 Nantou Bus issues package tickets with discount and convenient guide for Sun Moon Lake, Alisan, Xitou. You can buy these package at Nantou Bus counter in HSR Taichung Station(Gate 5, Floor 1), Gancheng Station(closed to Taichung Train Station), Puli Station, Shuishe Station. 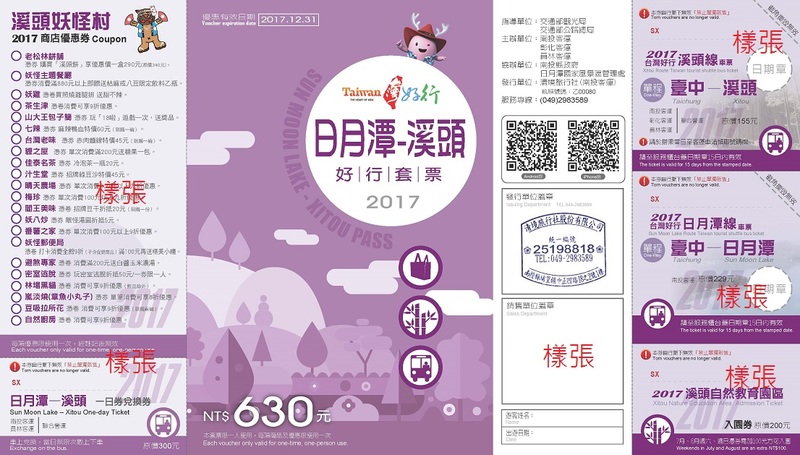 There are also package tickets for You can buy these package at Nantou Bus counter in HSR Taichung Station(Gate 5, Floor 1), Gancheng Station(closed to Taichung Train Station). You can also choose Gangchen Bus Station, 15 minutes away from Taichung Railway Station by walking, instead of "HSR Taichung Station" in the summary table above. Puli means you can stopover at National Chi Nan University, Taomikeng (Paper Dome), Dayan or Antique Assam Tea Farm. 3.For how to arrange the itinerary of Alisan & SML, please visit another post. You can find more itinerary examples from the following list. For more itinerary examples of other areas, including Taichung, Nantou & Chiayi, etc , please refer to Area Itinerary Examples. within a one day or within several consecutive days? If you have only 2D1N, I will recommend Cingjing &SML and stay one night at Cingjin. 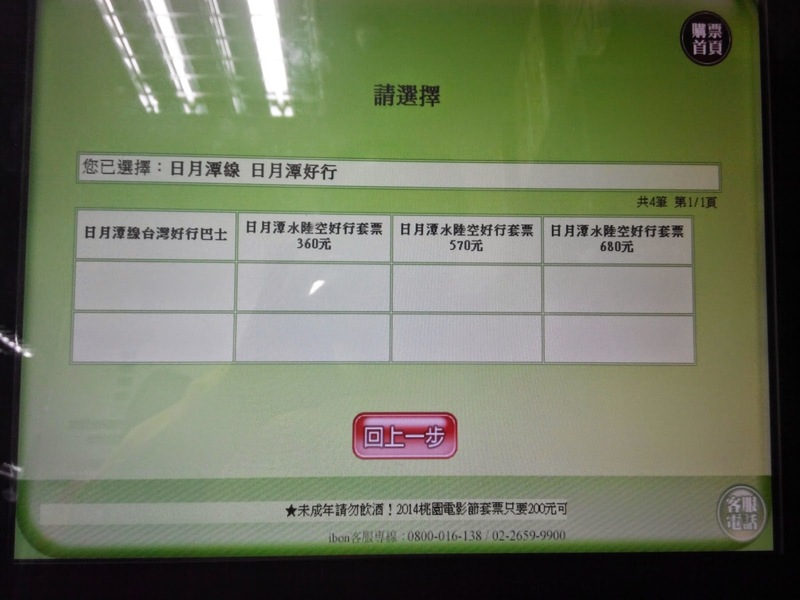 You could leave your luggage at the luggage storage center in Chengkung or Taichung Railway Station. Only NTD 30~70 for one day. Can you please help me as a first time traveller on a budget? Would be arriving at the airport at 6am in the morning. Plan to take the HSR to Taichung and from there proceed straight to SML. Is there any locker at SML for our luggage. We plan to move on to stay overnight at Cingjing after SML. Is that feasible? How should I proceed to Cingjing from SML? Do I need to transfer at Puli? Since you wont go to SML after SML->Cingjing, you don't need a locker at SML. You can transfer at Puli or take carpool between Cingjin and SML, depending on your budget. Hi, I plan to visit Alishan on 2 May 2016. Is the forest train still available in Chiayi? After that I have to transit from Fengchihu or shuttle bus up to Alishan right? 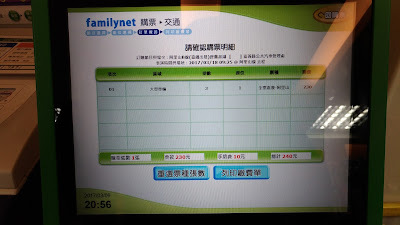 May I know how can I buy the train and bus ticket online? My English instruction is under construction. Hi, I wish to go to Sun Moon Lake and Cingjing from Taichung. Is it possible to cover both places within 1 day trip? How can I reach Sun Moon Lake then Cingjing from Taichung? 2.You may have less than one hour for Sun Moon Lake and Cingjing. In a normal itinerary, it takes more than 3 hours for each attraction. Hi I will be going to Taichung from Kaoshiung. I will be in Taichung for 3 days 2 nights. I have booked a hotel (Fengchia Disney) in Taichung from 16th -17th Dec and intend to book a minsu from 17th - 18th in Cingjing. I want to visit Alishan and Cingjing. May I know what is the best route to travel? If you don't want to go to Sun Moon Lake. IF you want to go to Sun Moon Lake. What are the methods available to get from Cingjing to Alishan and may I get a price comparison for them as well? Thank you! Hi, I arrived at Taichung at 7-8am and will have stay here for 2ngihts and 3 days. I want to visit both Alishan,SML and ofc taichung night markets. Is this feasible? Also can you suggest which pass is suitable for me and which attraction should i go first? Hi, I'll arrive at 1am at Taoyuan Airport. I plan to spend 3d2n in Alishan-SML-Cingjing. Can you suggest an itinerary for me? Which transportation is best for me to maximize the time? I will be traveling with a friend. Thanks! and transfer Bus 1618 to Chiayi Train Station. Hi, may I ask if I would like to travel from SML to Taichung (one way), where can I purchase the ticket and how much would it costs? If you have 2D1N, SML or Cingjing is better. Wow, I just want to say thank you for this detailed post!! I was literally dying from planning this trip because of all the bus lines and options until I saw your posts. Thanks so much! First, I am so very grateful for all the information your blog provides. It's amazing!! Second, I was wondering if there is transport between Qingjing and Alishan (if I skip SML). 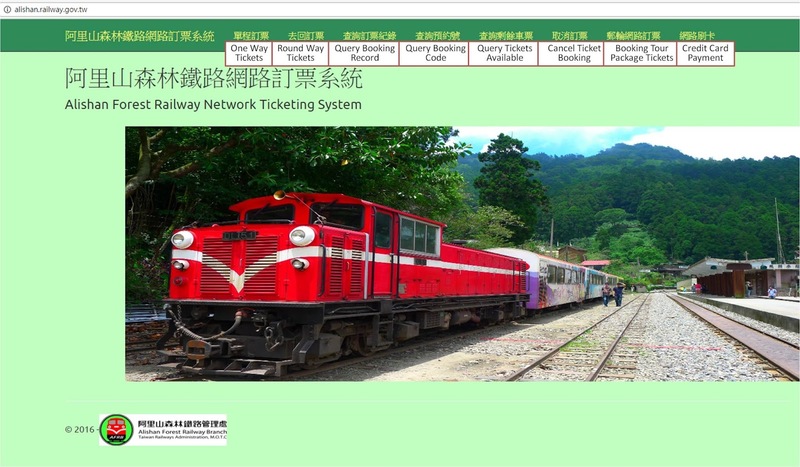 I am traveling from Taipei as well - would it make more sense to go Taipei-Qingjing-Alishan and then back? Or flip the order of Qingjing and Alishan? Cingjing->HSR Taichung Station->HSR Chiayi Station->Alisan. IF you skip SML, the order doesn't matter. However, you need to take a look of the timetable. hii what do you mean nantou bus? is it a bus or a bus station? so it is provided from cingjing? and you said from cingjing(nantou bus)transfer to puli or carpool direct to SML, do you mean if i choose not to carpool, so i will take the nantou bus to Puli than to SML? but how can i go from Puli to SML? is Puli there a bus or train station? i don't get it. In all of my blogs, I would say Station if there is a station. You need to transfer at Puli Station if you take bus to SML. 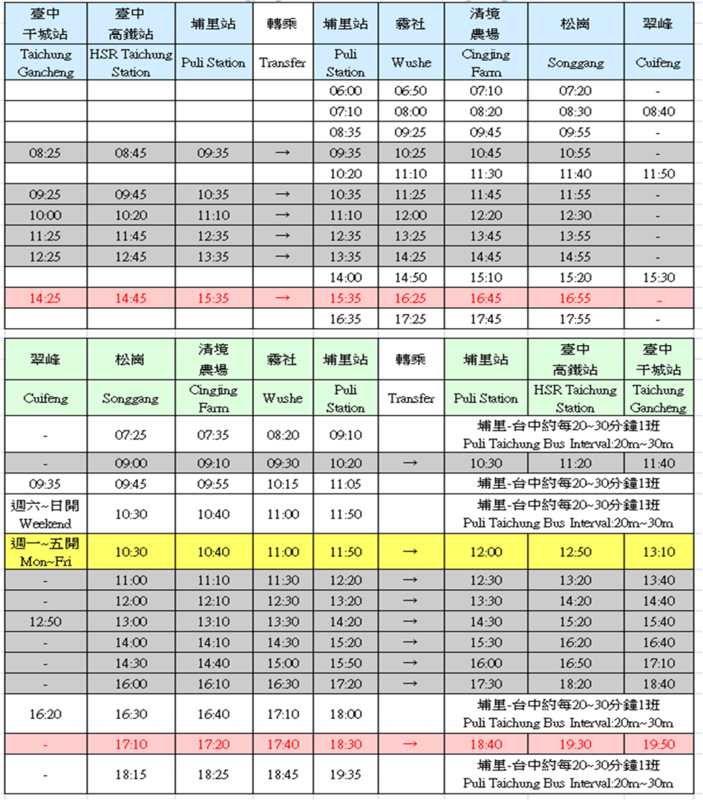 You can find the timetable by "Bus between Taichung & Cingjing" in this blog and Puli Station is in the timetable. plus, what do you mean nantou bus will provide package tickets? what are those? the tickets for playing there? or ferry tickets or? The package tickets include ropeway, ferry tickets , round lake bus. All the service is around SML. hi sullivan, im planning go to Love Moncoeur at Xinshe area. Can you advice me how to go there by using public transportation from feng jia? It's can take bus to zhong xing Ling bus stop then ride a cab to love moncoeur? Is there any ways i could go to Cingjing farm from Taroko? I am planning my trip to TW. The plan was to go from SML - Taichung and i have a few days in Taichung to tour the city. Was thinking to do a day trip to cingjing while i am in Taichung. Will it be better for me to go from SML - Cingjing straight? I am okay to spend a night in Cingjing if needed to. What are the transportation options available? Going to Cingjing from SML or vice versa is faster than from Taichung. But the carpool is only in the morning. planning a 9days trip to Beautiful taiwan with my 2 kids. Wanted to plan a trip to cinging farm, SML, alishan and torako. Wanted to cover it 4 days and visit taipei the rest of the day for pingxi and other attraction. Can u help to give some suggestion and minsu and have smooth travel. Thanks being reading your blog closely but still lost in the planning as this is our first trip to taiwan. My flight will arrive 3pm at Taichung airport. I plan to stay a night at a minsu in Cingjing. The carpool from airport to Cingjing costs 550NTD. If I don't want to take the carpool, how can I go from Taichung airport to Cingjing? How long and how much does it take? Yes.You can check google maps to have more details. There are about 3 alternatives. (2) The cheapest is about NTD 440, taking bus to Taichung Station and transfer. 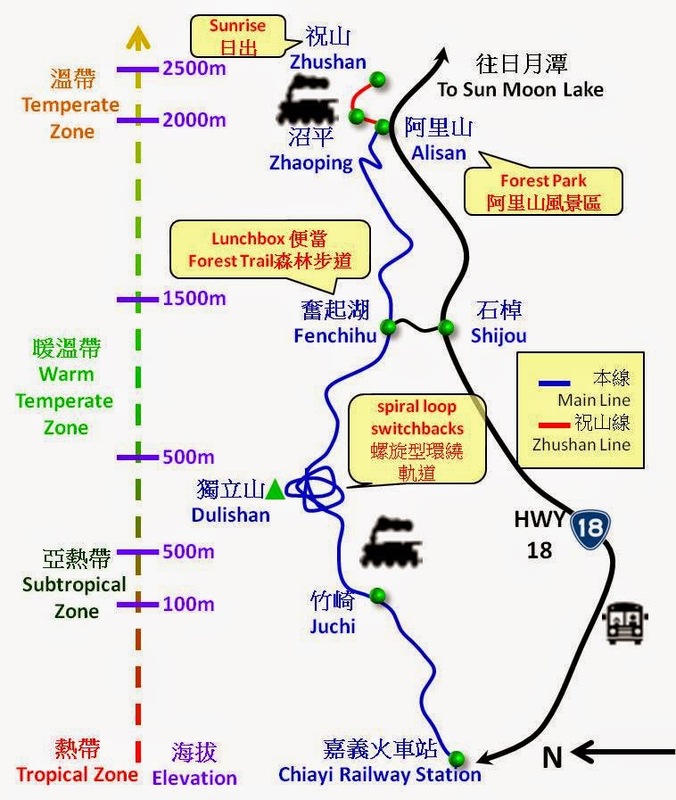 Another question that i want to ask, can we take Alishan Forest Train from Fenchihu to Chiayi? Or the transportation is just public/shuttle bus or taxi? Is there any luggage storage in Fenchihu area? You can take the forest train from Fenqichu to Chiayi. No storage luggage center there but lots people there luggage at the Fenqichu Train Station. I am planning a trip between Cingjing, SML and Alishan. I am arriving in Cingjing on 1st day evening and planning to visit Cingjing and SML in the second day, and then go to Alishan on the third day. Since my second day itinerary is tight, I am wondering if 2hrs is enough to visit Cingjing farm as I would like to spend more time in SML. And if it is easy to grab taxis around Cingjing (e.g from the main attraction area to the hotel). Any other travelling option between Cingjing and SML because ideally it would be best to arrive in SML around 1/2 pm. And can I know what you meant by the last train to Zhaoping is 13:00? since according to the timetable, there are trains after 13:00 to Zhaoping? There are carpool between Cinging & SML. mr chen, where's the pick up point at Qinjing farm before heading to SML? If you book pool car, the driver will pick up up at your hotel. The last 2 bus schedules for Puli=>CJ are at 15:35 & 16:35. You also mentioned carpool. Can you share more about carpool and its fare for SML=>CJ route?